I'm so happy I was able to squeeze in a ration menu this week! This menu came from the lunchbox meals for taking to school. I didn't have any beets, which was sad, because I would've loved to make spiced beets! 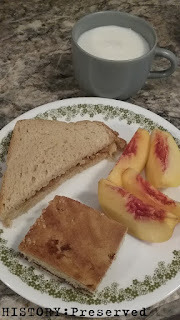 I used some fresh peaches we had instead since they're in season anyway. First of all, about the sandwich... I love baked beans on toast spread with butter (I use Bush's Baked Beans because they're my favorite), but I was wary of this sandwich for some reason. Let me tell you though, this sandwich was awesome!!! Like beans on toast, but with the softer bread texture. I made it by spreading the bread with butter first, mashed up a 1/2 cup or so of room-temp baked beans, and then spread it on. So good! 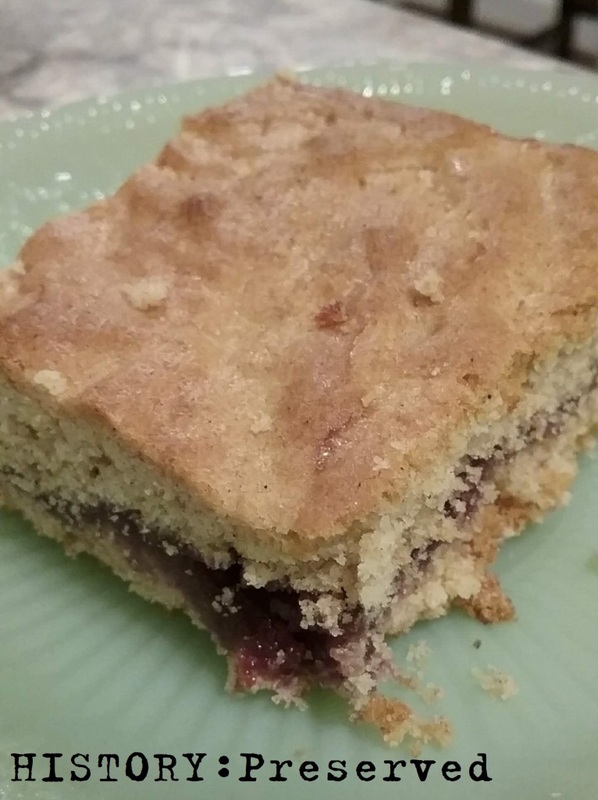 The Almond Jam Bars were interesting. They were more crumbly than I like, but were still yummy The almond comes from almond extract in the dough paired with cinnamon and cloves for spice. I used raspberry jam. I liked them cold the best, and I think the chill helped them keep their shape better too. A nice, tasty little treat! I'm hoping to try a menu from the lunchbox menus for the office next!